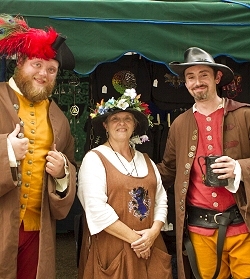 Travel back to 16th Century England! 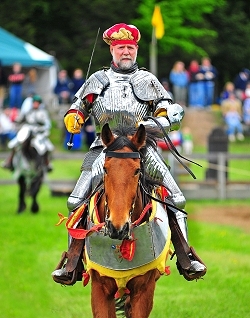 Enjoy the colorful pageantry of costumed villagers, artisan and musicians, laugh with merry entertainers, and cheer for your favorite knight in a full armoured joust. Castle Gwynn, a full size replica of a twelfth century border castle, welcomes festival-goers to tour the 1st floor and castle grounds. 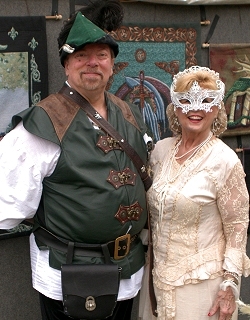 The RoseDan-Freeman Weaponry Collection and Imogene Stones' Tapestry Collection will be on display at the castle. 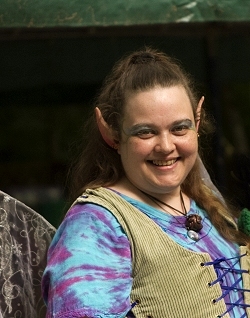 Come share the music, thrill at exciting stage presentations, jousting events, and much more at festive Covington Glen - it's incredible entertainment for all ages and a must-see for the entire family. The year is 1588. The Spanish Armada is attacking England. Elizabeth goes to rally her troops to defend England at Tilbury. There she arrives in armor and gives one of the most famous and powerful speeches in the history of England. It has become known as Tilbury speech. 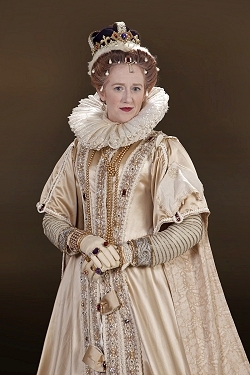 ("I know I have the body of a weak, feeble woman; but I have the heart and stomach of a king - and of a King of England too...") Today she comes to one of her favorite places on earth: Covington Glen. She comes to relax and await the outcome of the fight. She receives news of the destruction of the Armada as we close the day triumphant. help your child dress the part and enter the Children's Costume Contest at 12:30pm in the Children's Arts and Crafts area. Just added! Now you can download our Daily Entertainment Schedule, so you know who'll be where, and when! The Royal Joust The Free Lancers: Pure excitement and breathtaking action as armored Knights on horseback battle for supremacy on the Tournament Field. Three shows daily. Rated G.
activities resulting from the inherent risks of equine activities, pursuant to Tennessee Code Annotated, title 44, chapter 20. Paulo Garbanzo Blending comedy and amazing juggling into a show of death-defying skill, Paolo's supremacy over the laws of physics is not to be challenged! Rated PG. Oops! 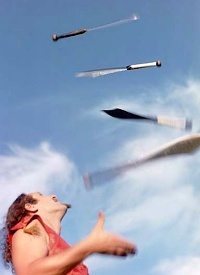 Comedy Knife Throwing Show Paolo Garbonzo and Giacomo the Jester (of Empty Hats) join forces to hurl razor-sharp blades at each other, risking life and limb for the entertainment of their fans! Rated PG. Daniel "Duke of Danger" Since running away from the Ringling Brothers Circus decades ago, Daniel has been performing his show featuring comedy, acrobatics, and bad decisions. He still has no idea what he wants to be when he grows up. Stop on by, enjoy yourself, and possibly offer some advice. 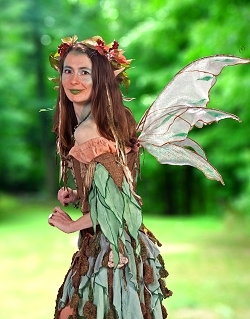 of Covington Glen Meet these mysterious creatures for fun and frivolity throughout the day and around the Festival. Rated G.
The Royal Rumble The villagers of Covington Glen take up arms and do battle. Swords, Staffs, fists, and word. It's a Battle Royale! Rated G.
Birds of Prey Join Master Falconer Ash Cary for an amazing and educational birds of prey demonstration showcasing hawks, owls, and falcons. Hear about each species' adaptations, their impact on the eco-system, and why we need to protect them, as well as a bit of the history of the sport of falconry and how we train our birds. Rated G.
Comedy Opera Bob DaVinci takes his audiences on a hilarious ride as they become players in his wacky view of art, history, inventions, culture, and opera parodies. Rated PG. Empty Hats Unplugged...but Wired. This band of talented musicians comes to our village to amaze audiences with their high-energy Celtic music, both traditional and original. Rated G.
Giacomo's Ballads Giacomo of Empty Hats takes the stage by himself, to sing songs from heart. The beauty of love and romance. Rated G.
Buckle & Swash Comedy sword-fighting show! 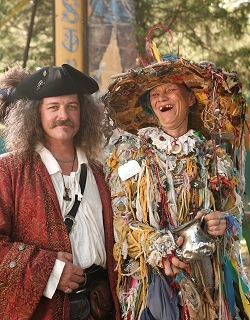 Where Captain Red and his first mate spin tales of pirates and their misadventures on the high sea. Come join the crew and become a part of pirate history. ARRRRRR...! Rated G.
and the Fairies Join Ik the Troll and his Fairy Friends as they tell fairytales from their point of view. Come learn the truth about the tales you grew up with. Rated G.
Variety Show The New Castle Player Interns will delight and entertain you with their talents and skills. Rated G.
Royal Improv Comedy Buckle & Swash team up with colorful characters from around Covington Glen, to entertain you with interactive side-splitting improv comedy. One show daily. 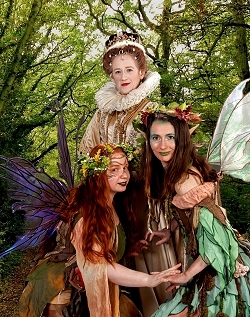 Rated G.
Robin Hood Join Robin Hood and Maid Marian for magical storytelling, featuring audience members in starring roles. Heroes, villains, cheering, screaming, and hilarity ensue! Rated G.
Rafferty the Piper The sound of the Highland Pipes will fill the air of Covington Glen as Rafferty performs his unique piping skills. Rafferty joins with Empty Hats for special Celtic music. 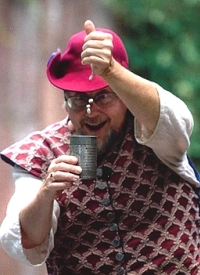 Rated G.
Isaac Fawlkes, Magician Fawlkes� blend of comedy and magic is perfect for the entire family. His first responsibility as an entertainer is to entertain the audience and make sure everybody has a good time. And when Isaac Fawlkes takes the stage, everybody does. Rated G.
Queen's Knighting Ceremony This free activity is a chance for children of all ages to meet and be knighted Queen Elizabeth herself. Rated G.
Celticopia Demetrius and friends of Empty Hats put their own special spin on music, to put a song in your heart. Rated G.
The Roses Master musicians Michael Rosa and Teddy Johnson are true musicians of the Renaissance period. Hear instrumental court and country music from the 14th to the 16th centuries. Rated G.
Tea with Lady Ettie Do not let her looks deceive you - Lady Ettie is the unquestioned expert in Renaissance fashion and etiquette - just ask her! Her shows will enlighten and amuse any audience. Rated G.
The Tennessee Renaissance Festival. All rights reserved. Webmastering and hosting services provided by Just Adequate Media.